As of this writing, there are 1,248 customer comments and 199 answered questions for the DEWALT Lithium Ion XR Brushless Blower. I have read the customer feedback and then condensed the results into this review. I hope this review helps you when shopping for the best leaf blower to keep your yard maintained. The DEWALT Lithium Ion XR Brushless Blower has a brushless motor, which maximizes the motor efficiency and durability. The innovative axial fan design maximizes air output and runtime. This leaf blower has 400 CFM and 90 MPH performance. It features a variable trigger and speed lock. 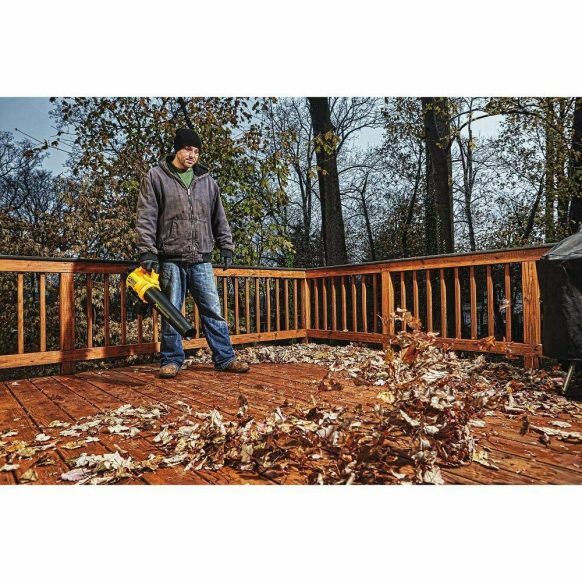 This leaf blower is lightweight, and the ergonomic design maximizes control and minimizes stress on your arm. This product includes a 20V MAX 5.0Ah Lithium Ion Battery, along with a charger. The fact that you don't have to drag a cord around with The DEWALT Lithium Ion XR Brushless Blower may be one of the best features of it. A lot of people switched to this leaf blower from an electric leaf blower because it is cordless. A customer shared, "I have used an electric for years but just got tired of dragging the 50 or 100 yds of extension cord around. Especially when blowing clippings and leaves from around the pool. Had to pay attention to keep the cord from dropping into the pool. This product is lightweight so has ease of use for extended work. Charges quickly and holds the charge for a long time to get the job done. I primarily use it for blowing out the garage, parking deck, and front walkway. But especially for blowing debris, leaves, clippings from around the pool. Works great for these small jobs." Battery operated leaf blowers, in general, are not as powerful as gas powered leaf blowers. 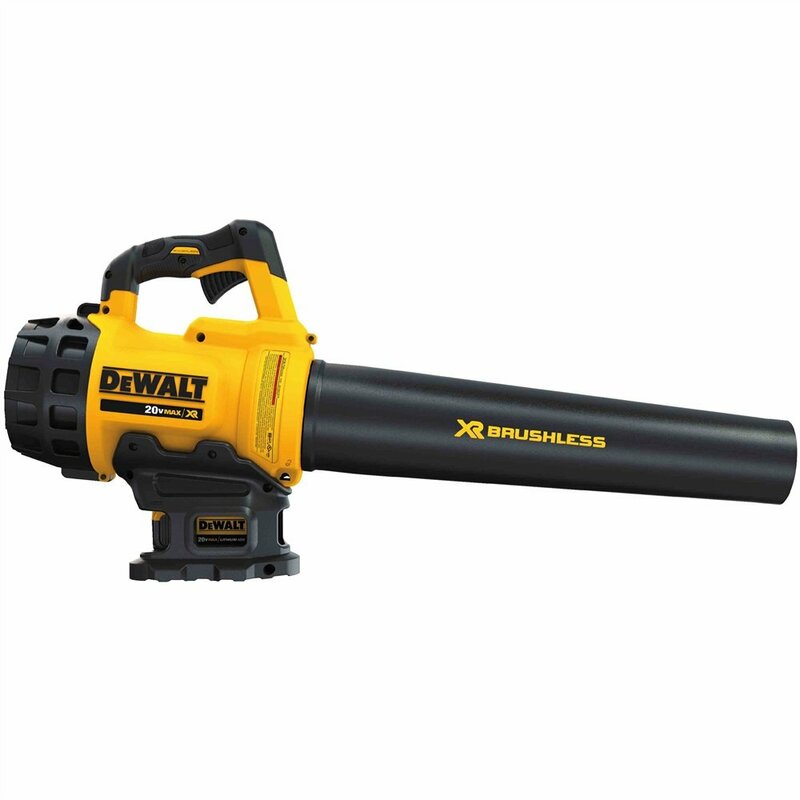 But with that being said, The DEWALT Lithium Ion XR Brushless Blower had good reviews for being powerful for a battery operated leaf blower. Here is one of the positive comments, "Having used other earlier, rechargeable tools, I expected a feeble attempt at a leaf blower, especially a 20 volt one. I was pleasantly surprised--this unit packs quite a punch, such that you can feel it pushing back at you. Perhaps the airspeed isn't as high as other blowers, but the air volume is huge. I had no problem cleaning wet leaves off the driveway; something that's challenging even for a corded blower. So far, the battery capacity will get me about 20 minutes to half-hour--not outstanding, but adequate for my 220-foot long driveway." The DEWALT Lithium Ion XR Brushless Blower scored well with customers for being practically maintenance-free. Here is one of those comments, "I don't see this on anyone's list of top cordless blowers and I don't know why. I can't imagine anything working better than this thing. I've never used those big gas-powered blowers with the backpack. I'm sure they work better. But there's also a lot of trouble with those. This thing is pretty much maintenance free. I also have a Craftsman blower rated at 135mph and a corded Worx blower and this thing kicks both of their butts. Like bad. Like it's not even close. As others have said, it's not as much about the speed of the air, it's about the volume. And this thing moves a ton of air. When you walk with it you feel like you're bringing a huge blast of wind with you everywhere you go." The DEWALT Lithium Ion XR Brushless Blower weighs just 7.1 pounds. This is very lightweight compared to a lot of other leaf blowers. Being lightweight means that it should be easier to carry around, such as climbing a ladder to blow leaves out of a gutter. A customer said, "So much more manageable and quiet than a gas powered one. I climbed up a ladder with this the other day and used it to clean out my gutters after a storm, it took about 2 minutes. Wouldn't have been easy or even possible with a gas blower, and would have taken a half hour to do by hand. I use this for my garage/yard/driveway on an acre of land. So far it works well on dust/dirt/grass clippings/small amounts of leaves." For what you are getting, the price is good. Keep in mind that everything is included that you will need to run this leaf blower. Not all products include a battery. But this one does. A customer shared, "Excellent product. Actually, very reasonably priced considering the 5 amp battery and charger that come with it. Blower is very sturdy and built as expected from Dewalt. Battery lasts at least twenty minutes and can be used with any of the 20V batteries. Great product." The DEWALT Lithium Ion XR Brushless Blower has 400 CFM. Some people felt that it could have been better. Here is one of the comments pertaining to CFM: "I got this as a gift and I am a little disappointed in its power. This really is only for dry grass, leaves, sawdust, etc. on a dry smooth surface. The biggest problem is the tube is too wide. It allows for more CFMs but the MPH is too low at 90. If they balanced it a little more I think the product would be better. I put a slightly smaller adapter on the end but it sounded like I was stressing the motor so I quickly took it off (the air also sounded weird blowing through the tube, I guess they have to acoustically calibrate the tube when they design it). I knew it wouldn't replace gas but when I pay the dewalt proemium I expect to at least match the lower priced competitors in overall performance. I think dewalt could have done better with this but it's definitely not a total miss." The noise level of The DEWALT Lithium Ion XR Brushless Blower is very low, especially compared to gas powered leaf blowers. This is especially nice if you have close neighbors. Low noise output means you can leaf blow during early morning and late evening hours without worrying about waking up neighbors. A customer shared, "I love the lockout feature to simply turn it on full blast and go and the noise is NOTHING compared to a gas engine. I don't think it will cut the mustard for yard work where sticks and twigs are stuck in long grass but I'm willing to give it a try. I love the instant on and no fumes of battery powered tools. I have no plans to get rid of my backpack blower for large jobs but I think it will get used a whole lot less because of my new Dewalt blower. I'm 100% satisfied with this tool and its exceeded my expectations in every way possible. Great buy." Approximately half of the comments about customer service were negative and about half were positive. Here is one of the negative ones, "I normally love Dewalt Tools. I bought this tool, threw away the box and receipt. I became accustomed to DeWalt being a good brand. Very disappointed with this tool. Underpowered, Battery only lasts about 10-15 minutes with this blower. I tried to let Dewalt know I was unhappy. Very poor customer service experience to add to the poor experience. Would not spend the money on this tool." The DEWALT Lithium Ion XR Brushless Blower has a brushless motor to maximize motor efficiency and durability. The innovative axial fan design maximizes air output and run time. This leaf blower has 400 CFM and 90 MPH performance. It features a variable trigger and speed lock. This leaf blower is lightweight. It is designed to maximize control and minimize stress on your arm. This leaf blower includes a 20V MAX 5.0Ah Lithium Ion Battery, along with a charger. The customer service is questionable with about half of the reviews being positive and about half negative. Here are some top questions that I found for people considering buying the DEWALT Lithium Ion XR Brushless Blower. Does the nozzle tube come off for storage? Yes, but you have to have a flat headed screwdriver to insert in a hole and make one turn. After that, it pops right off. How large is the nozzle opening? The nozzle opening is about 3 1/2 inches wide. Does this leaf blower come with a bag attachment? No, it does not come with a bag attachment.